I first fell for the charms of the Style Club – and ombre hair – late last year and since then, have kept going back for more (read this post to find out why!). 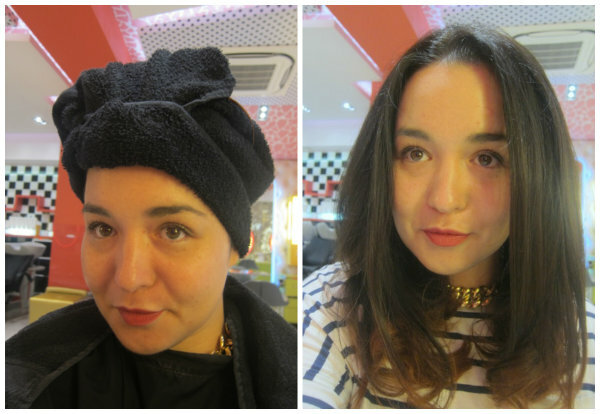 Most recently I was invited in to refresh my style for summer, with a L’Oreal Colour Pop Treatment. Colour Pop is all about experimenting with colour in a fun, commitment-free way. I went for a flame red colour over the lightened ends of my hair: I liked that, because the colour is non-permanent and ammonia free, it won’t cause further damage. In fact, Colour Pop goes one step further and offers a conditioning treatment plus colour in one – it left my hair feeling soft and incredibly shiny, and I loved the vibrant shade. If you’re after a more natural effect, you can go for a shade that will complement your own hair colour or opt for a clear gloss, to condition and add some serious shine. The treatment is €43.88, which includes a blowdry, or about €25 on top of your usual cut. It’s a fun, easy way to add a bit of colour to your look – it takes just 15 minutes, and you can expect it to last up to 10 washes, depending on your hair (although my colour was gone in four). I really like the conditioning aspect of the treatment and it’s definitely something I’ll be trying again – the only question is, which shade should I go for next?! Find The Style Club at North Earl Street, Dublin 1 or check out the website for more. I love colour pop, great way to freshen up your colour. The guys in North Earl st are lovely as well! I LOVE this colour on your ends Emma, it's perfect for the summer. I'm getting my hair done today ready for my hols - can't wait!!! Ooh I love the pop of color on you dear! Thanks lovelies - really recommend this treatment if you're looking for a change! You look awesome my dear!!! I love how the salon is decorated! So awesome Emma! It looks fab and your hair is so shiny! Emma your hair looks fantastic! This is a really nice idea to give a bit of a change to your hair without going to mad. My red colour is almost all grown out of my hair now and every time I see a redhead I want to dye it again! If only it wasn't so drying for my hair! Gorgeous, gorgeous, gorgeous finished result! Love love love this, I f I knew a non permanent, harmless way of adding ombre colour existed I wouldn't have bleached mine. Looks fabulous! Lovely fun change and commitment free... Love this!